Utilities are facing some of the strongest headwinds in their century-old history. Technology is changing how energy and resources are produced, transported, and consumed, as well as our ability to conserve them. Digital technologies have changed not so much the nature of utility services, but how consumer expect them to be delivered. They are also opening avenues for utilities to do different things, while deeply transforming their core operating model. •Digital utility maturity. 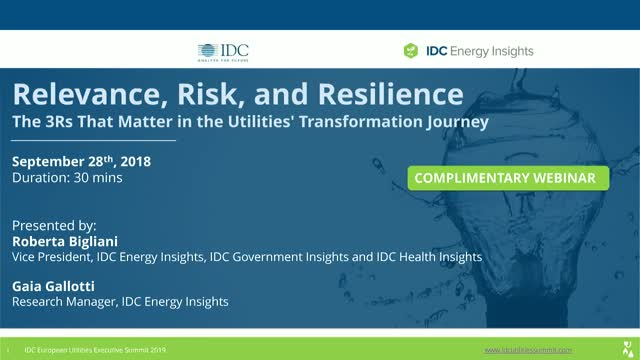 Most utilities fall into what IDC defines digitally distraught organizations. These companies are either running digital as an impromptu effort, running multiple digital strategies initiated by the line of business, or are operating with a short-term perspective. •Roadblocks on the transformation journey. Transforming is not an easy journey and most of utilities are facing execution challenges. Siloed initiatives, limited expertise, and weak roadmaps are but a few of the most common stumbling blocks. •New key success factors utilities should consider as they evolve toward digitally determined organizations and how leading European utilities are working with the ecosystem to overcome some of the barriers to transformation. Today's power markets in North America are facing changes and challenges which are driving investment and activity in the industry's digital transformation efforts. This webinar will give an overview of the major drivers, trends and activities where technology investments are being made as the utility and power sector takes on digital transformation. How is platform environment developing in the mining sector? IDC Energy Insights explores what it means to be digitally determined and the organization, measuring and road mapping of mining companies that are digitally determined.